A video showing Casey Anthony’s guilty reaction to learning her daughter’s remains had been discovered has finally been released. The 2.27 minute video was filmed inside a Florida jail in 2008 where Casey was held prior to the discovery of her then ‘missing’ daughter Casey’s corpse. 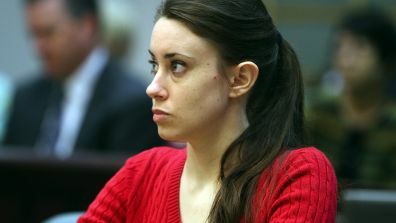 Of fairly poor quality, the grainy video shows Casey Anthony looking guilty as sin so its no surprise that her defense team wanted to keep it under wraps – at least until they could get murder mom off the hook. The video shows Anthony in the waiting room of the jail’s medical facility, when she looks up at a TV screen and sees a news report on the discovery of Caylee Anthony’s remains. Casey appears to double over with her hands in her lap and then appears to breathe heavily. Although under kept secure from the press since 2009 the video has now been leaked and shows yet another aspect of Casey’s guilt. Casey, 25, was found not guilty of murdering her daughter Caylee. She was found GUILTY on four counts of providing false information to a law enforcement officer.